Is this offensive to you? The entire notion was certainly offensive to the person who posted the graphic on an atheist Internet community. And I get it. We grow up learning concepts like “An eye for an eye, and a tooth for a tooth” (in fact, a section of the Bible called ‘Exodus’ calls for this treatment). As kids we often hotly tell our parents “that’s not fair!!”. And as parents, we endlessly, sometimes obsessively, strive to treat our children with fairness. So when people hear about others who seem to get away with murder, they rightfully scream and holler in protest. Like I said, I get that. You have heard that it was said, ‘An eye for an eye, and a tooth for a tooth.’ But I tell you, don’t fight back against someone who wants to do harm to you. If they hit you on the right cheek, let them hit the other cheek, too. This is radical. This is upside down to how our culture thinks. In fact, for some people (such as the person who posted the graphic above), this is downright ludicrous. If you believe there is a Heaven, don’t you want it to be far, FAR better than this world? Don’t you want it to be free of anger, resentment, jealousy, rage, greed, violence and ignorance? If you do, then what about forgiveness? Don’t you want Heaven to be saturated — heck, OVERFLOWING — with forgiveness? If you’re still with me, then a Heaven that is free of our human weaknesses and welcoming to all will absolutely include killers and their victims. In both cases, these people will have repented of their sins (however big or small we might consider them to be) and been utterly, utterly transformed through faith in what Jesus Christ did for them. What did He do? For those who have sincerely accepted the gift of Jesus, He allowed Himself to be sacrificed on a cross to make up for all (and I mean ALL) the bad things we’ve done and the good things we’ve failed to do. For those who seriously accepted the gift of Jesus, God looks at us and DOESN’T see murder or greed or theft or fraud or lying or betrayal or self-centredness. He sees only the perfection of His Son. 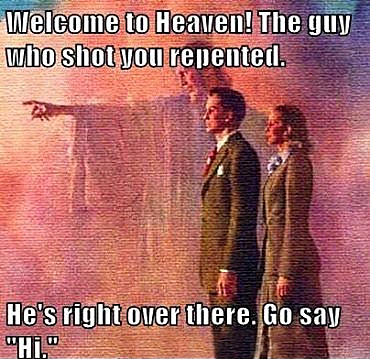 So when the murder victims depicted in the graphic above get to Heaven and are directed to the person who shot them, they will ABSOLUTELY go over and do more than say “Hi”. They’ll hug that person with overflowing love. And that person, utterly transformed by following Jesus, will absolutely hug those people right back. It will be a time of joy, of tears, of praise for their creator who wiped away every moment of fear, anguish, pain and sadness and replaced them with praise and gratefulness. That’s a place I want to go. That’s a place I want YOU to go, so we can hug, high-five each other and spend eternity with our creator. Are you in? Yes or no, post your thoughts below and let’s have a conversation. Except that YHWH is a jealous god, a vengeful god, a genocidal god etc. He could not forgive the satan and he cannot forgive those who doubt or disbelieve. Heaven cannot be full of forgiveness. The cost of entry and rules for staying necessarily make it so. Actually, it does not address my point about heaven. All this essay says is that people always credit god for good thongs but forget to credit him for the bad. That is exactly how superstitions work. It’s not that God does not forgive disbelief, but he does not force anyone to believe in him or accept his forgiveness. You can’t make someone love you. Anyone who has experienced unrequited love knows how it feels to love someone who rejects you. That’s the heartbreak God feels when we don’t accept his love and forgiveness. It’s free to anyone who accepts the gift. But if we reject him, don’t want to believe he exists, don’t want or feel we need to be forgiven, God gives us the free will to make that choice, but there are consequences. I have accepted his gift of forgiveness and look forward to eternity in heaven with him. Yes! Count me in! And, in the here and now, may our loving God help us to turn the other cheek as often as needed. Blessings, Frank!